Truckstop! Live art for community event. Down at Saporium in Sydney one cool spring night a gathering of Food Trucks united to lure in locals for some family friendly food, drinks, dogs, djs, tunes and smirks. Me and a few of the other Brush Project artists got together to share a bit of the creativity that Birdhat, William Nghiem, Yuri Trechswjakow and Sean Pointing had to offer. With plenty of smiles the gang from Local Artist Division had a blast spraying themselves thanks to the Work-Shop and Brewery Yard Markets for putting it together. I was called up to do an interview for some amazing design students at UNSW Fine Art + Design school and talk about my practice. This was a great opportunity to spill the beans on how I made it in the creative world so far. I share some tips on resources and recommend and some I wish I had used while I was levelling up. The audio quality is a bit shonky because it's a student video, but I think the content in here is worth a listen. Charity Exhibition Opening Night Party and Event! I'm involved in another group exhibition to raise some money for Beyond Blue with the legends over at Beach Burrito Co and Tee Cee tees. It's a mix of Australia's quirkiest and interesting street/skate artists and their whacky illustrations or paintings. The launch party is sure to be a laugh so swing along, grab a drink and help out with our fundraising for a good cause. We all can feel this cause hit home because between friends and family I'm sure we all know someone who's been affected by depression and anxiety at some point in their life. Fresh New Prints in the store! I've got my first print release in a couple of years! Fresh new posters to deck your walls out with fresh eye candy! So stoked to see these getting printed! For the month of March I'm doing a pre-sale for my loyal supporters. The first 10 of each print sold will also get their own original drawing - of whatever you want! There is a form when you hit pre-order where I grab all the details from you to include in the sketch. I love you guys and your ideas so get in quick to snare that sweet deal! Don't like to miss out on early bird discounts? I respect your privacy. I love your support. Stoked to share this fun commission I worked on recently! I was asked to create an imaginative shadow of a kid full of fun bright and colourful ideas and themes. 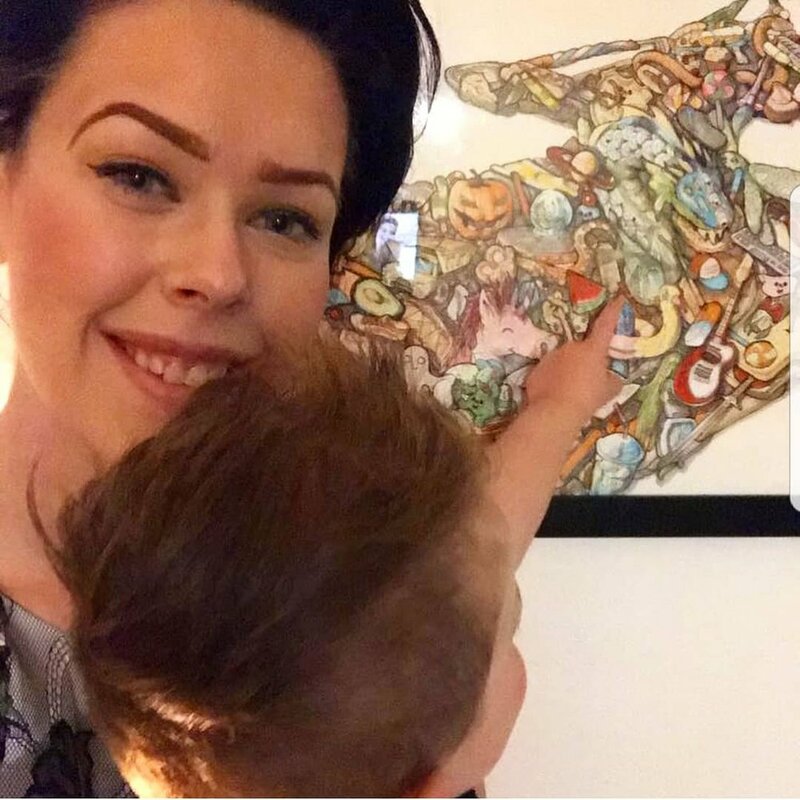 It was a blast to put together the combination of items, I used to love getting lost in the intricate illustrated kids picture books when I was growing up. I'm stoked to have this piece in the kid's room and hope to inspire and excite his imagination as he is growing up. 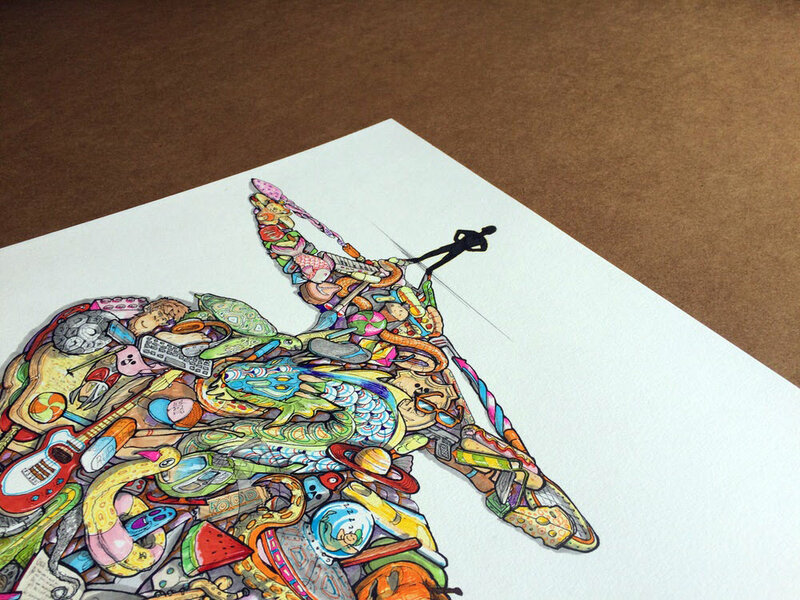 Maybe you've got ideas for your own custom artwork like this, have a look at other examples and get in touch. Angled close up of bright colourful psychedelic illustration of cheery kid's imaginative dreamscape. child's imagination visualised through bright cheery illustration. Close up shot of finished illustrated imagination dreamscape. 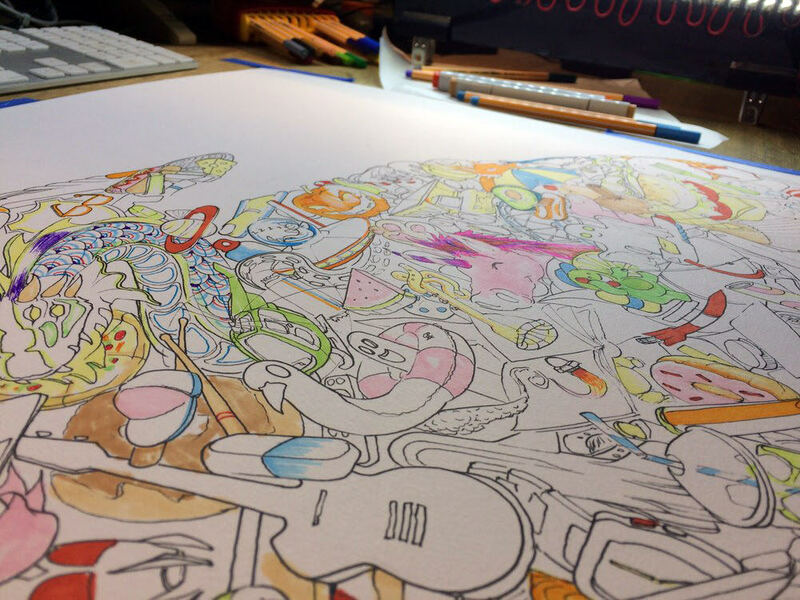 Imagination dreamscape illustration with bright colourful markers surrounding the workspace. Silhouette of kid with big imagination drawing. Finished illustration of child's imagination. 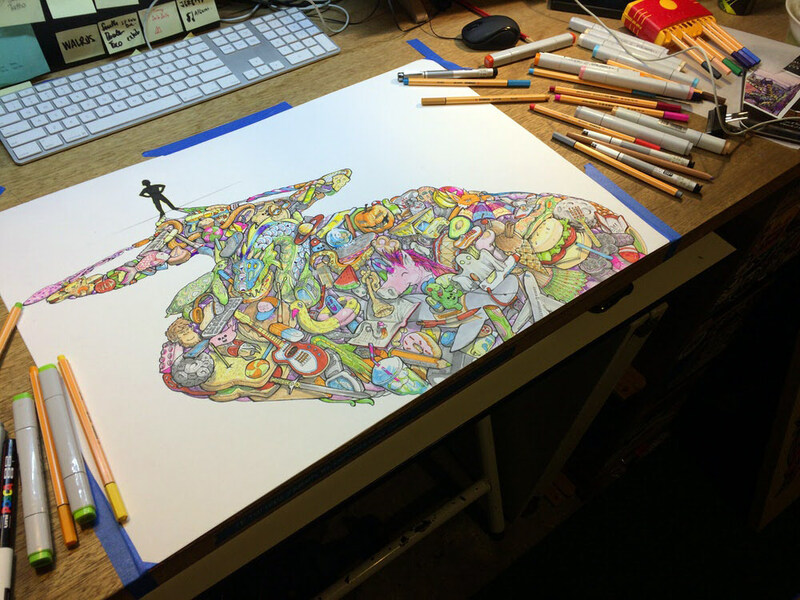 Timelapse of a kids imaginative dreamscape drawing. Here is a time-lapse of the whole thing coming together from start to end. If this inspired you to think of someone who deserves to receive a custom painting have a look over at my other examples of these personalized gift artworks. How learning about business changed my life. Learning about the business of selling my services as a freelancer was the most beneficial skill I learned post university. I studied design but barely managed to get any info on pricing or how to make a living at being a creative. If your education is like mine, they don’t teach you much about how to make a living from those fancy new design skills you know. You have to go elsewhere for that. I avoided the 9-5 of working for a design firm and instead threw myself into my own art and figured out how to make a living on my own terms. This allowed me the lifestyle I wanted but no money to fund it. I was constantly struggling until I began to hound the business side of things. I got sick of not being a success. So I began to research how other people have done it. I chased podcasts, lectures, books, courses and youtube videos, I went to conferences, I talked to other creatives and managed to gather up enough ideas and mindsets that would serve me along my path. The main one I learned was that you never get there, you always need to be learning. I neglected to learn more about the actual skills for a while as I saw the ability to sell my self as more valuable than the design talent. I chased professionalism over raw talent. I had a better chance to make a mark and help my clients through getting out there and doing the work rather than sitting in the dark and hounding through preparation. Learn by doing. In school and at uni I saw business as boring or dull and a waste of time. Now that I'm using this new knowledge to build my own life I see it as a game. Instead of working for a grade or a mark, you are learning and being tested with cash rewards. The better you get, the more money you get. Who wouldn’t like to get money for learning a skill.? Once I reframed how I thought about learning and realised that I would get cash rewards everything changed for me. So I learned how to enjoy learning. My journey through all this discovery towards making a living from my creative talents is a never ending one and I want to help you reach your goal. So if you want to follow along I'll start posting weekly to get these lifehacks and tactics out into the world. In my next post I’ll write out my process that I used to learn all of my life hacks for making more money doing what you're good at. This week is an exciting live art display for the 2016 BEAMZ art festival in Chippendale. Uncover your urban swagger in Chippendale’s downtown this year at BEAMS! With the support of Colliers, the festival is bringing together some of Sydney’s best street artists for a one-night jam on Saturday 17 September. Curated by Scott Marsh and Pip Louey, this graffiti wall will be electrified by the urban flare of over 40 artists including Mulga, MAID, OxKing, YIPES, Emmanuel Moore, Jess Cochrane, Krimsone, M-Lon, MAN.De, jumbo, Joel Cameron, Anthony Jones, CAMO, NOTNOTCAMSCOTT, The Infamous DogFight and Ayla the Caveman - just to name a few. Their pieces will plaster O’Connor Street in a 100m long graffiti wall stretching right through the heart of the festival. Decked out with their spray cans you can watch these urban innovators spray, splatter and smear the walls with colour as they energise the festival with their brilliant burners from 5 - 10pm. But the fun doesn’t stop there… you have the chance to grab one of these neat works at our Silent Auction on Tuesday 20 September. Kicking off at AMBUSH Project Space Central Park Mall, Level 3 from 6 - 8pm. Whilst supporting local artists you will also raising money for STARRTS’ program Of Our Times - A Musical Odyssey. This creative cultural program empowers young refugees through creative exploration and is one of many remarkable projects that STARTTS organises to help support refugee rebuild their lives in Australia. So round up the crew and come join us at BEAMS for a festival that will send Sydney buzzing with creative brilliance. The team at Just Another Agency in Melbourne and Wacom Australia have put on a competition to select some of Australia's best illustrators and artist for a new collaborative publication. The launch event featuring other amazing artists will be on in Melbourne's Verge Gallery on September 8th in Fed Square. My Stay Fierce piece was selected to exhibit on the night and be included in the publication too. There is a public voting system which could win you a Wacom Bamboo as a prize for entering! Go here to vote for my work and help me win some gear to help me on my journey!